Can a Christian escape from a lion? How quickly can a rumour spread? Can you fool an airline into accepting oversize baggage? Recreational mathematics is full of frivolous questions where the mathematician's art can be brought to bear. But play often has a purpose. In mathematics, it can sharpen skills, provide amusement, or simply surprise, and books of problems have been the stock-in-trade of mathematicians for centuries. This collection is designed to be sipped from, rather than consumed in one sitting. The questions range in difficulty: the most challenging offer a glimpse of deep results that engage mathematicians today; even the easiest prompt readers to think about mathematics. All come with solutions, many with hints, and most with illustrations. 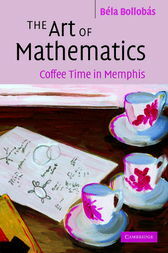 Whether you are an expert, or a beginner or an amateur mathematician, this book will delight for a lifetime.